Build Your Own (BYO) Frag Pack allows you to tell us exactly how many frags you want at each price point! This way, you can customize your order to fit your market demands precisely. This frag pack is designed for you to customize the price ratios in your order, without having to pick idividual varieties one by one. Can't sell anything over $10? Do your customers prefer frags over $20? Whatever your needs are, we can help, no problem! Just tell us how many frags you want in each price category, and we will choose an assortment of our favorite frags to meet your specific needs. 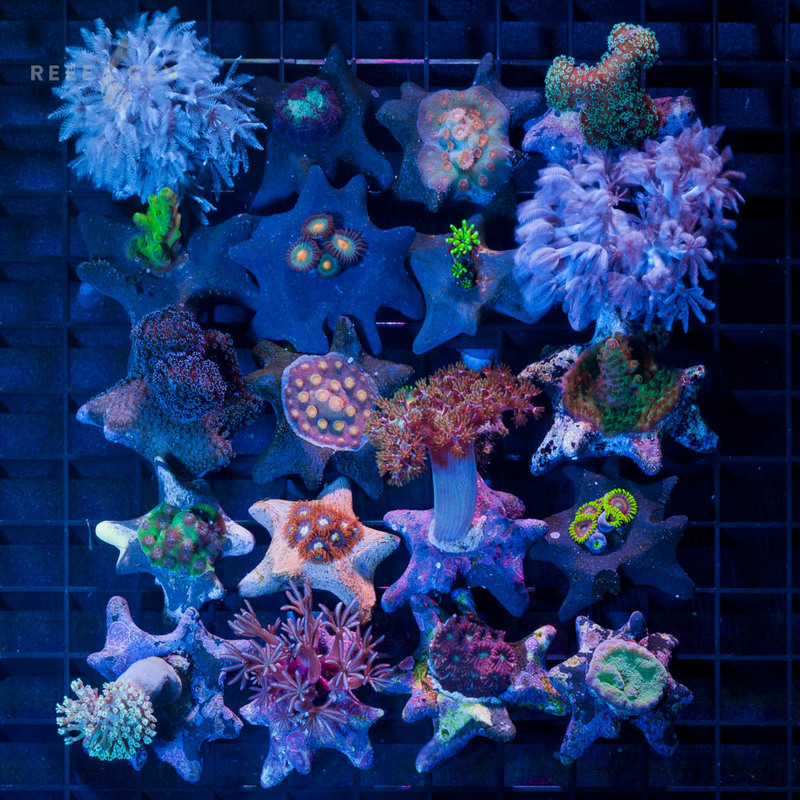 Below is a list of some of the coral that we have available in each price category. This list is a guide of what may be included in your frag pack, but not a guarantee. Please feel free to request for certain varieties to be included or excluded. 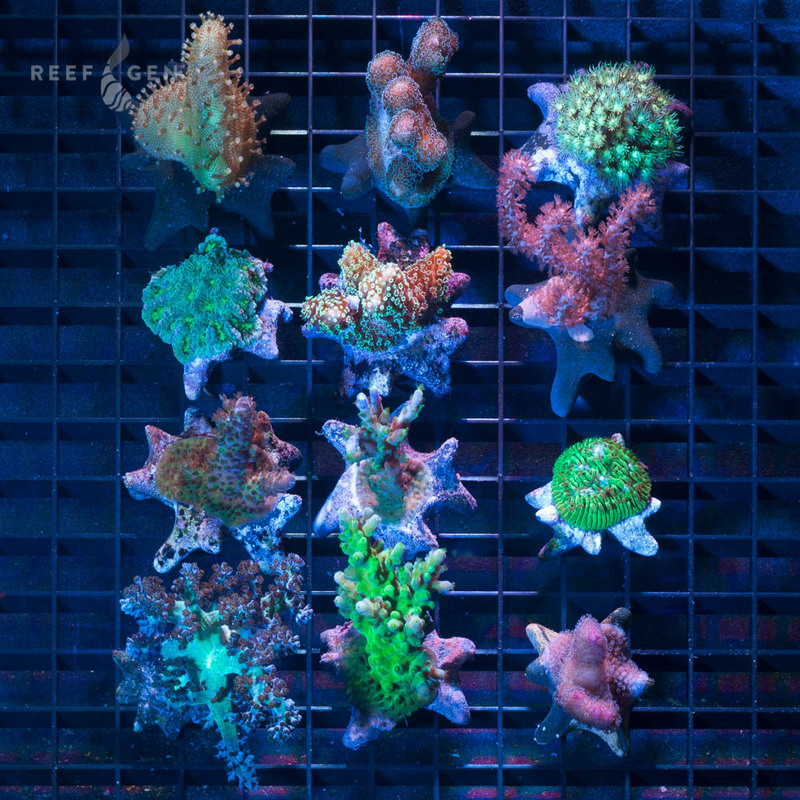 Typically, we aim to have no more than ~3 replicates of each coral variety in a frag pack. Let us know i fyou would like more or less of any particular coral. Let's BYO frag satisfaction together! Class B Frags: 1” Assorted Xenia, 1” tall Floppy Toadstools, Red Discoma Shroom, Cherry Actinia Anemones, ¾” Green Titan Acros, ¾” Blue tip Acros, ¾” Blue Ocean Stylos, ¾” Green Stylos, Merletti blasto, ¾” -1” Yellow Turbinaria, Orange Pavona maldivensis, ¾” Persied Cyphastrea, 1” Green Birdsnest, 1” Blue Kenya tree, 1” Misc Acros, 1”Green Cyphastrea. 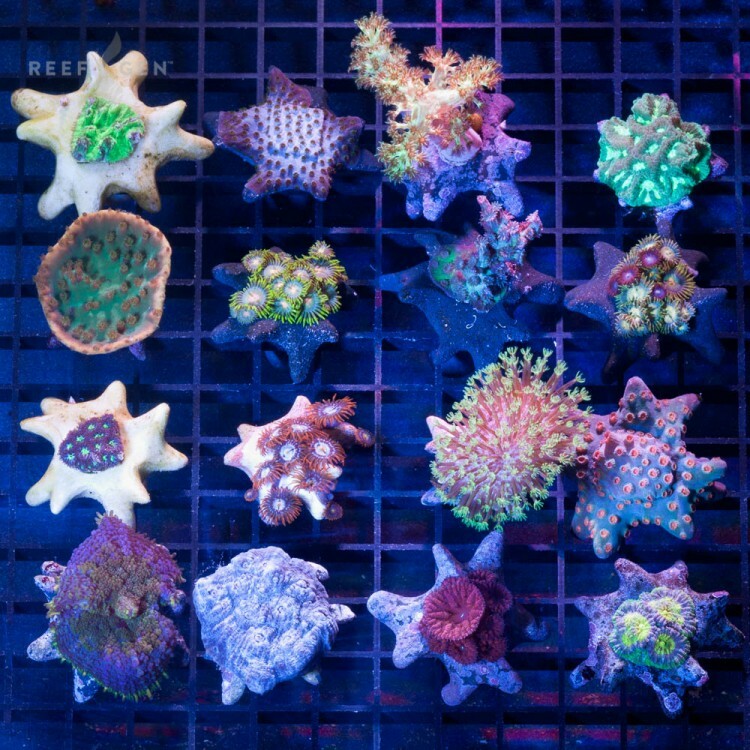 Class C Frags: 2” Tracy Morgonian Gorgonian, 1” Julian’s Golden Gorg, Neon Orange Psammocoras, 3-4 Polyp Zoa frags, ½” Yellow Canary Sponge, 1” Yellow Porites, 1-2 polyp Red Indo Blastos, ¾”-1” Purple Milka Stylos, 1.5” Pink and Green Pocillopora, 1.5” Sprung Stunner Chalices, 1-2 Head Neon Green Duncans, Small Malibu/ Ventura/ Laguna Favias (1 mouth/ ½ inch), ¾” Small Monet Lillies Cyphastrea, Small Misc Favia. Class F Frags: 1-2” Purple (Tort and Laura’s) Acro, Josh’sTeal Acro echinata, Chucky’s Revenge Acro vermiculata, 1-2+” Crosette Inferno Mushroom, Project F Fungia (grey/pink with green tentacles and orange mouth,) Orange Delight Acan echinata, Euphoric Euphyllia 1 Big Head, 1+” Orchid Stylo, Grafted pink and green Pocilloporas, 2” (open) Sm. Green Gonioporas, Pink Reverse Superman Monti, 1.5” Yellow-rimmed Turbinaria, Orange Sunset Zebra Leptoseris, Sarlacc Leptastrea, Rainbow Acan echinata, etc. Class G Frags: Yellow Yutz Psammocora, 2” Burgers Cerulean Blue Acro, 1” Ultra Purple Tip Stag (bright burgers), Black Heart Favia, 1-2+” Burning Brocade Shroom, Spectrum Acan echinata, 2” Green Titan Acros, Nice Poinsettia Favia, etc. 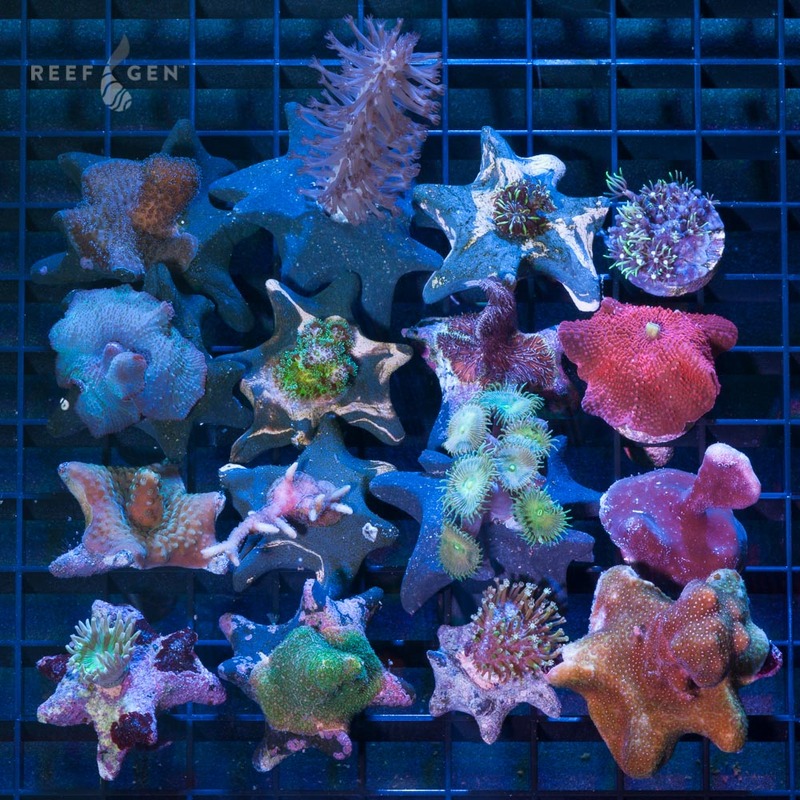 Class H Frags: Red Daisy Stuchburyi Goni, Mind Reader Acan, Mother Of Glory Acan, Sm Area 51 Moseleya, etc!